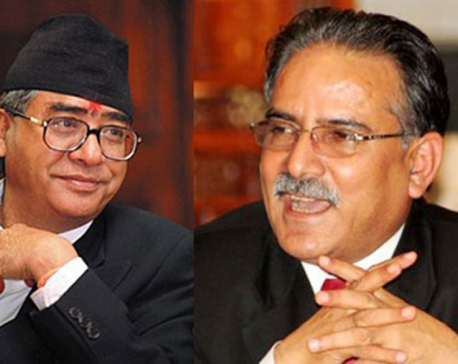 KATHMANDU, Feb 8: With the informal deadline for the transfer of government leadership to the Nepali Congress (NC) fast approaching, relations between the two ruling parties-NC and CPN (Maoist Center) -have soured lately, multiple sources confirmed. After the failure of the government to announce a date for local polls, the NC has grown suspicious over the intentions of Prime Minister Pushpa Kamal Dahal. Some NC leaders have accused the Maoists of adopting a strategy of prolonging their stay at the helm of government through dilly-dallying over the local polls. Earlier, NC and the Maoists had reached an informal understanding on handover of the government leadership to the NC after concluding the local polls by mid-April. But with the prospects of holding the local polls within the agreed deadline becoming slim, NC leaders have started demanding that Prime Minister Dahal step down to pave the way for the formation of a NC-led government even if the polls are not held. “As per the agreement, Dahal should hand over government leadership to NC after mid-April even if he fails to conduct the local polls,” said influential NC leader Dr Shekher Koirala. However, a senior leader of the Maoist party argued that the NC should compromise for a month on taking leadership of the government as it was equally responsible for the delay in announcing the local poll date. “The Maoists alone are not responsible for the delay in announcing the date for local polls. If the NC is ready to go for polls without bringing the agitating Madhes-based parties on board, the Maoists are ready to announce the poll date without waiting for another day,” argued Maoist leader Haribol Gajurel. However, NC leaders fear that the Maoists may not hand over the government leadership even after May as they may be planning to unveil the budget under their leadership. The new constitution has made it mandatory to unveil the budget by the end of May every year. “The Maoist chairman appears to be trying to prolong his leadership of the governmentg by delaying local polls,” alleged NC lawmaker Ramhari Khatiwada. He also accused the Maoists of not working to bring the agitating opposition parties on board the constitution amendment process and negotiating with those parties. “NC is for holding local polls at any cost at the earliest possible. But the Maoists appear to be working to delay things at least until October,” said Khatiwada. Besides differences concerning local polls and the handover of government leadership, a fresh dispute has emerged between the chiefs of the two parties over the appointment of the next inspector general of Nepal Police. According to top leaders of the two parties, Prime Minister Dahal is in favor of appointing DIG Nawaraj Silawal as the new IGP, while NC chief Sher Bahadur Deuba wants to appoint Jaya Bahadur Chand.